In A Tale of Two Cities, when Charles Dickens penned his famous quote, "it was the best of times, it was the worst of times," while he was relating how opposing factions viewed the French Revolution, one might make a similar observation regarding the return of the cicadas in June, 2013, after a 17-year hiatus. Entomology is the scientific study of insects. "For entomophobes, this is the season of despair. For the entomophiles, this is the season of joy," said University of Maryland entomologist Michael Raupp, using his highfalutin terms for bug-haters and bug-lovers. But what about those songs they sing, and all the songs inspired by the cicada? 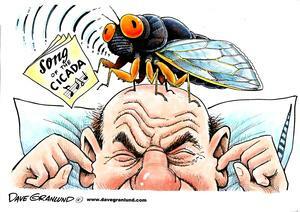 After all, while the chirp of a single Magicicada septendecim, a type of cicada is barely noticeable - the simultaneous chirping of a million of them reaches decibel levels that are overwhelming. Their 'singing' is created by a rasping of their legs and wings to produce a high pitched whine. Perhaps some of those bug-haters would come around if they took a listen. Well, perhaps not! Actually the military might consider using these recordings to interrogate combatants - might be a suitable replacement for water-boarding. OK, well, what about the songs inspired by cicadas? David Rothenberg, a musician who's been inspired by the sounds of animals has incorporated birds and whales into some of his previous song compositions. Two years ago, Rothenberg made music with periodical cicadas in Illinois. The tidal wave of sound generated by hundreds, sometimes thousands of males as they call for females was the percussion to his woodwinds. He detailed his adventure in his new book "Bug Music" and the accompanying CD of the same name. This year he will accompany 2013's "Brood II" - a composition that celebrates the cicada song, their mating ritual and their impending death (cicadas only live for one month after they emerge from their underground denizens). Songwriter Kathy Ashworth has taken to song with a humorous approach to the return of these pesty little critters. She parodies the Cicada East Coast invasion with lyrics that talk about them "hatching' and chill-axing" while waiting 17 years to buzz in our ears! But what is the significance of the 17-year life cycle? Some think it evolved as a defense mechanism where the time lag makes it difficult for predators to specialize in eating them. And when they do emerge, their overwhelming numbers make any losses insignificant - so the species can continue to propagate. Another theory hinges on the number 17's status as a prime number. If the cicadas returned every ten or fifteen years, their emergence would coincide with predators whose life-cycles neatly divided into theirs. 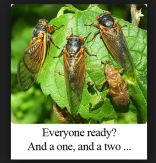 Perhaps the seventeen year cicadas made it this far because, due to their prime-number loving ways, no other animals were able to sync up with their reproductive cycle. In any event, the evolution of the cicada is a cautionary tale for us humans. As much as we think we have the ability to transcend our mortal plight in life, in the end, man ends up where he started. While we don't live most of our lives in vegetative state (save that rare breed that are known as couch potatoes), we do exhibit patterns of continually circling back, as exhibited by reunions, birthdays, anniversaries and even in life's grand scheme of things, i.e. the circle of life (dust to dust, etcetera, etcetera). bwaySteve BakerNo where is this paradigm more poignantly described than in songwriter bwaySteve Baker's melodic ballad, "Going Nowhere (at the speed of light)." The song's theme underscores how man can travel the world over only to realize that life's journey always ends up "where you are." So the best we can do, like the cicada is experience each day as it comes. Whether it's for 17 years or decades longer - all we can do is just sit back and enjoy the ride! So what are some of your favorite cicada songs? Comment below with links to some of your favorite songs by those who have been inspired or by previous broods that have appeared perhaps 17 or 34 years ago. Unlikely Friends! The Animal Video Of The Day!! !